Does the arrangement of letters on a keyboard baffle you? Well, it’s been that way since Christopher Sholes invented the typewriter in 1868 (U.S. patent 207,559 in 1878). 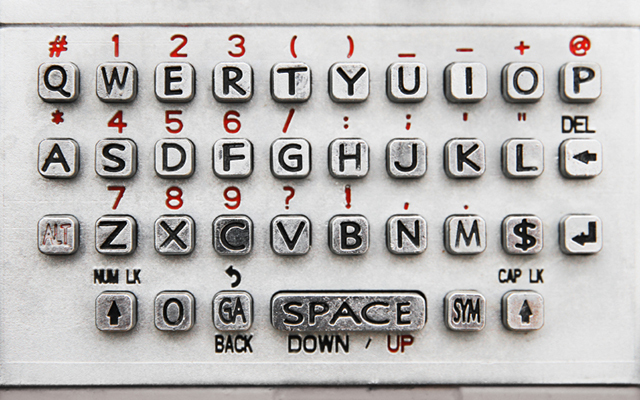 Though there seems to be no logical reason why our keyboards bear such a weird matrix of letters, QWERTY keyboards have quite a rich history, and the layout is something we’ve grown accustomed to. Sholes allegedly studied common letter combinations and then arranged the keys so as to separate commonly used letter combinations to slow down typists and thus prevent his newfangled machine from jamming. There’s no documentation to support this statement, though Sholes’ attempt to slow you down does make your 85 words per minute typing skills sound a bit more impressive. Even though typewriters have evolved since the release of Remington’s Sholes & Glidden model in 1873 — and we no longer have to worry about keys jamming on our smartphones — QWERTY endures. But not without controversy. There’s actually a school of thought against the QWERTY arrangement — the Dvorak, Colemak and Capewell keyboards arrange letters and characters for more efficiency, but after 150 years of training our brains and our fingertips for QWERTY, these ergonomically designed keyboards haven’t achieved critical mass. It’s not surprising they haven’t — could you imagine relearning to type on this keyboards? Here’s a rundown of QWERTY’s top competitors (some of which are available for implementation on your smartphone, in case you want to convert). Dvorak: Dvorak is the earliest challenger to QWERTY, having been patented by Dr. August Dvorak and his brother-in-law, Dr. William Dealey, in 1936. The Dvorak layout is more efficient and requires less finger movement than QWERTY, which boosts typing speed and also reduces the risk of long-term strain from typing. On the Dvorak, commonly used vowels and consonants are in the middle row, so you can type around 400 words just on that row, as compared to about 100 on QWERTY keyboards. Colemak: Colemak was released in 2006 as an ergonomic and efficient alternative to QWERTY and Dvorak, and it’s named after its creator, Shai Coleman (combined with the “k” of Dvorak). The Colemak saves your fingers from doing excess movement — your fingers move 2.2 times more on QWERTY than on Colemak, and there are 35x more words you can type using only the home row on Colemak than on QWERTY. Capewell: Michael Capewell developed the Capewell-Dvorak keyboard, which he found to be more comfortable than the Dvorak, and he’s developing an algorithm for a more “evolved” keyboard layout. His goals are to minimize finger movements, which Capewell expects to amount to 48% less than on QWERTY, a feat he’ll accomplish by maximizing common letter combinations, such as AS, WE, FE, LI, IOU, WER, REA, ON. For those who rely on keyboard shortcuts, rest assured that Capewell will keep Z, X, C and V keys in the bottom left row, so you can CTRL+Z/X/C/V as you always have. Though these keyboards may look wonky and could take some getting used to, the Dvorak and ilk are indeed more conducive to fast typing — we entered some text from Mashable’s “about” page and analyzed it on various keyboards. Here’s how it breaks down — it’s clear that QWERTY is the least efficient keyboard layout. We’re either gluttons for punishment or hopelessly devoted to QWERTY.